This author’s thesis is based on his personal observation of Morihei’s art at the Aikikai Hombu Dojo during the late 1960s, the author’s analysis of “old films” of Morihei and the perceived similiarities in Ueshiba’s technique to various Chinese martial arts, and the fact that O-Sensei spent time in Manchuria during his lifetime. I have heard this and similar theories about an “obvious” and unacknowledged Chinese connection that influenced the development of aikido repeatedly for the last 30 years or so. You will notice that that above-mentioned author provides no specifics to support his claim. In my experience, this is always the case when such a theory is advanced. Let’s take a closer look at this subject using our knowledge of Morihei’s life to consider the feasibility of such a theory. Morihei Ueshiba did indeed spent time in Manchuria on three occasions during his life: as an infantryman during the Russo-Japanese in the 1904-1905 period; as a bodyguard to Onisaburo Deguchi on an ill-fated expedition through Manchuria and possibly Mongolia over a half-year period in 1924; as a visiting martial arts instructor during short stays in Japanese-controlled Manchukuo in 1939, 1940, and 1942. I would like to provide some specifics about Morihei’s experiences in Manchuria to help the reader decide whether Morihei could have had an opportunity to study Chinese martial arts in any depth during these timeframes. First of all, Morihei was an ordinary foot soldier who served in the Dalian region of Manchuria during the Russo-Japanese War. Military discipline was very strict due to wartime conditions and the Japanese of that period considered themselves culturally superior to the Chinese. It doesn’t appear credible to me that he might have somehow have found an opportunity to escape from his military duties to study under some local master or masters of Chinese internal martial arts. Morihei’s second visit to Manchuria took place in 1924. He was a member of the expedition of religious leader Onisaburo Deguchi and served as the former’s personal bodyguard. The stated objective of this secretive foray into China was the establishment of an independent utopian colony in Mongolia where members of all religions would be welcome to practice their beliefs freely. The reality was the Onisaburo was enmeshed in the politics and operations of the region and had numerous ties to ultranationalist Japanese and the Kwantung army. Onisaburo’s group was supported by a local warlord that mounted an army of 1,000 men which declared themselves a “Mongolian Independence Army.” Members of this ragtag army were soon slaughtered by the dominant Chinese military forces who controlled the region, and Onisaburo, Morihei, and other Japanese members of the party were arrested. They narrowly escaped execution on this occasion. His primary role was to protect and support Onisaburo. The Japanese party was constantly on the move in wilderness areas and became entangled in several dangerous skirmishes. To my way of thinking, there would have been no opportunity for Morihei to have engaged in a serious study of Chinese martial arts during this period either. Later in his life when he was already a recognized martial arts master, Morihei traveled to Shinkyo (present-day Chanchung), the capitol of Manchukuo and headquarters of the Kwantung army, on three occasions. 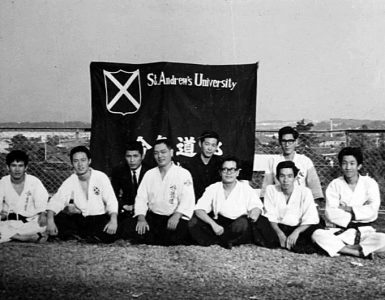 Having been invited by his student Kenji Tomiki, Morihei demonstrated and taught his Aiki Budo to students of Kenkoku University, built by the Japanese, in 1939, 1940, and 1942. His visits were fairly short, a few weeks in duration, and once again it is difficult to conceive of a set of circumstances that would have permitted Ueshiba to have learned from a Chinese martial arts master. Morihei himself was already a highly regarded martial artist and the Japanese completely controlled this area of China both politically and militarily. Is it possible that Morihei may have witnessed some Chinese martial arts during his time in Manchuria? Certainly, it is possible. Could he have grasped some of the “inner secrets” of Chinese martial arts merely through observation? I will admit that being possible as well. But that is not what proponents of this Chinese theory are asserting. Their hypothesis is that Morihei had extensive training in Manchuria under Chinese masters and that the subtle ki manifestations of the founder’s aikido originate from Chinese sources. In a nutshell, their argument is this: “The subtle aspects of aikido resemble Chinese internal martial arts. Chinese martial arts predate Japanese martial arts. Morihei Ueshiba spent time in China. Therefore, aikido was heavily influenced by Chinese sources.” Where is the proof? A further thought. Most of these theorists seem to discount the level and sophistication of Daito-ryu Aikijujutsu that Morihei learned from Japanese jujutsu master Sokaku Takeda during a 15-year period starting in 1915. Sokaku taught primarily jujutsu but possessed much higher inner skills that he showed only to a few of his most talented students, Morihei being one of them. Another point worthy of mention is that Morihei was heavily involved in the Omoto religious sect co-founded by Onisaburo Deguchi. He learned many meditation and breathing techniques that he practiced assiduously and that he credited with having been responsible for much of his progress as a martial artist. The points I have presented here have all been published, especially on this website, and can be retrieved by searching the worldwide web. I believe that writers and historians on this subject should conduct a survey of already published materials and compare them with their hypothesis before publishing their theories. If they have historical proof it should be offered and corraborated if they wish to be taken seriously. The final point that you presented is, IMO, the correct one. Many of the same things that were said about Ueshiba’s skills were also said about Takeda. Takeda also produced other students with reputations of similar skill as Ueshiba. Though it’s really not hard to see how most don’t view Daito-ryu as any more of an internal art than they do Aikido, considering there’s so little internal skill to be found in them. As always, well researhed and well said. I have been practicing Aikido for 35 years and i’ve been recently practicing Sagawa’s Daito Ryu aiki-jujutsu for two years. i found them quite different and wandered what could be the big difference between them. The base is, in a way, nearly the same. What seemed different from an aikido point of view is that Daito was very linear and Aikido was round. Why? Wouldn’t it be because O’Sensei tried to solve the problem of facing multiple attackers his own way, by turning. He could have found the answer without watching Chinese martial artists practicing Ba Gua. Perpetual movement, circular movement, Tai sabaki, Tenkan, Ueshiba’s own mark. I’m working for the moment on Bakumatsu (End of Shogunate1853-1867). It struck me that, in the multiple assassinations that took place in the 1860’s, the attacks followed always the same scheme: six, eight or more attacking, encircling one. Very few escaped! There are some similarities, technically, with arts like Chin’na. Once, I had the chance to train with a Xing Yi boxer. Xing Yi, Bagua, and Taiji Chuan are related arts. He said that katatedori shihonage omote looked just like one of the basic sets of Xing Yi. This guy was a boxer by the way – a ferocious fighter in sparring! Here is the way that my Wing Chun teacher thinks that these things happen – human bodies are human bodies. A kick can’t be strictly Chinese, a punch can’t be strictly Western, and a lock can’t be strictly Japanese. Same for internal stuff. Culturally, several peoples have arrived at similar conclusions in related studies while being separates by continents. This person’s specific claim is hard to accept. I’m sure that in Ueshiba’s travels he may have come across many a master in many an art. The Chinese artists traveled also, I’m sure. More likely, Ueshiba may have had some texts or manuals of some arts, much like we do today – studying other forms through reading. I’m not saying that this is the source of any Chinese influence. I’m just saying – I’m very sure that credit has been given where credit is due, in regard to his skill set. That is fabulous, I`m pretty sure I have read in John Stevens book essence of Aikido and also in AJ DVD THE FOUNDER OF AIKIDO, it states as a child when studying at the local shingon Buddhist school, he studied the 9 Chinese classics? Just a thought. I think your outlook is sensible and probably the most likely. Aikido and the Chinese Connection sounds like a new book frontier in the over saturated Aikido book market. I indeed think that aikido has a lot of in common with bagua movements, especially in terms of footwork. If we take a look at http://www.youtube.com/watch?v=kAcLBTJCO8c one can see that this is jodan tsuki ikkyo with perfect kuzushi before throwing the partner. It’s interesting to see how similar it is. One has to have to skill to trap the punch initially. Thanks for the link, Zoran! So what? Let us suppose that this pseudo intellectual quasi specialist assertion is true and that a Chinese man or the man in the moon for that matter, found taisabaki to work a few years before a Japanese person. Does it matter? 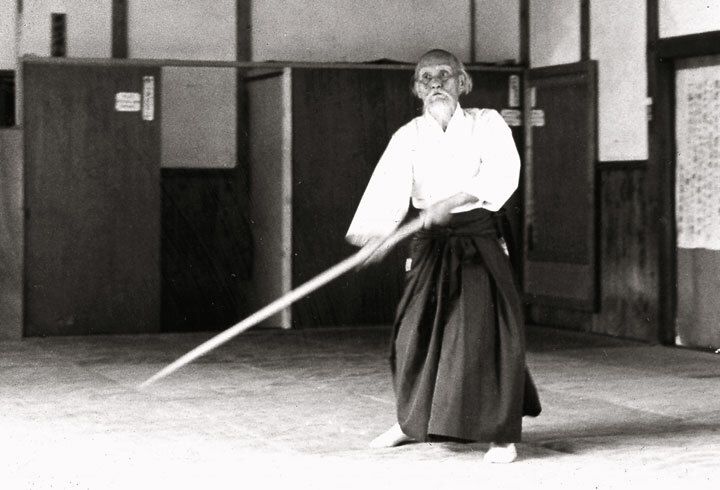 Maybe Ueshiba’s skills came from planet Beetle Juice or Thor’s left foot but there is no proof of that either. Or maybe he was “influenced” by the Mayan crystal skulls, channeling a Native American chief or the hundredth monkey, but does that somehow detract from his unique journey?. Stuck in a box, closed minded linear thinking is the scourge of humanity. Out if context idle talk and circular arguments contribute little of value to the art. And that is why Aikido is now mainly a crippled art going nowhere but mostly fakery. But it need not. Discussions about “Influence” are largely irrelevant and go nowhere trying suggest a weakness rather than honour keen observation or discovery through practice. Whether nature or nurture, whether innate or observed, the question is and remains ARE YOU TRAINING OR TALKING? Fables are nice but the art is here now. Who is practicing it and who is merely discussing it? TRAIN TODAY! NOW! WORK OUT WHAT WORKS AND WHAT DOES NOT! The reason the “art” side of Budo exists is to enable us to THINK and to OBSERVE and to test common sense possibilities, to explore, discover, research and develop. Too comfortable suburbanites with idle minds have the time to come up with this abject speculative kaka because they’ve never actually had to survive! People who come up with this endless c**p are generally noticeable for their key feature which is not training very much. There have always been fighting arts and they are all similar because people want to survive, so they use what works. They extract it by training and refine it by keeping an open mind. It’s as simple as that. There are very thin linear connections and schools and traditions, whilst essential, are just a means for passing on the basics. Refining these basics is a personal path. Desperate speculators should worry about their own history. Have you been training, putting in the time and effort or have you been raising balloons at the pub? Nev, It matters because once you establish a new frontier in Aikido, you can exploit it through writing books and giving seminars on the Aikido seminar circuit. Here is why, it is because people find the idea new, and very intriguing. It is like a hidden undiscovered room, fresh with things to discover. It also broadens their repertoire of knowledge, and that is something of value. Here is the crux, there is nothing new to know about Aikido. There is nothing new left to discover in Aikido. 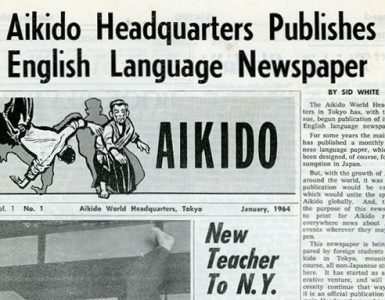 All the information about Aikido is out there at our fingertips, and it has been there for many years. That information is old hat. Now there hasn’t been new substantial information on Aikido for sometime. So when someone comes along and fabricates a, plausible, new frontier, it is a very tantalizing proposition to the Aikido world. There are parts of the Aikido world very interested in such new possibilities, and there are those new to Aikido who will be also attracted and supportive the new idea of a Chinese Connection. Yes, it does matter. 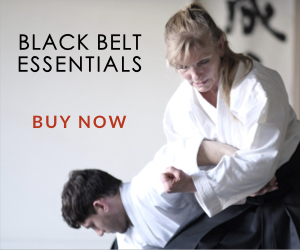 The question now is will it go viral and become part of Aikido history? There is considerable Chinese influence in Japanese culture and it is unlikely that the martial arts in Japan have avoided that influence. One historian, I forget who, famously stated that Japan was a culture in search of a civilisation and that China was a civilisation in search of a culture. Given the unifying nature of Aikido, I am frankly surprised at debates that seek to ascribe national ownership to studies involving the human spirit – it seems a trifle chauvinistic. That an art is expressed through a cultural filter is only natural. Perhaps in years to come, as Aikido is more fully assimilated into other cultures in the west, it will share some of those cultural attributes. It could be argued that this is already happening, particularly in France, America and Russia. Chinese influence in Japanese martial arts from the 16th century on is well established. Initially I am sure that its form was imitated, but as it was more fully assimilated into the culture of Japan in time the fit would naturally appear seamless. Cultural relativism makes a nonsense of purist notions of cultural absolutism. Joe, we’re singing the same song. Yes it does matter that people will try to influence the gullible with bull. Today is here. Miss a training session and THAT does matter as it could cost you your life prematurely to your finishing the things you were born to do. Talk is interesting. Training is essential. Nev, agreed. I understand what you are saying, “shut up and train.” There is great value in that adage. I tend to place a bit more value on talk because talk persuades. Language is connected to ideas, and ideas dictate, as well as shape our views on training. Least I mention how we train. Someone who fabricates artificial connections can completely change training from its philosophy to techniques. Bagua Circle Walking is a Daoist practice (also similar to Dervish Surfi whirling, despite the similarities neither practices are connected to one another) appears similar to Osensei’s practice of him moving in circles on the mat. A practice likely resulting from Takeda and swordsmanship and not a religious practice integrated into an early 19th century Chinese Martial art. Now, if the Chinese Connection between the two practices, and thus, it is widely accepted as a truth, Aikido would be greatly altered. Possibly to an extent of alteration that evaporates true Aikido. I fear Circle Walking being confused with Osensei’s randori movements would confuse and create great misinformation. Thereby, changing the approach and the practice of Aikido waza as intended by Osensei. Talk is extremely powerful, and can be harmful when it isn’t the facts. An issue, I am deeply concerned about. The acceptance of a Chinese influence will not create a new Aikido style, rather it will change the very essence of Osensei’s Aikido. Yes, shut up and train is important. But, I want to add in this case so is talk. Something we need to be vigilant about if we wish to preserve Aikido. In my experience, I started to understand Aikido better when I started to go deeper in my Taiji practice (notice that the Yang Taiji style that I practice comes from a direct line, what could be compared to Iwama style if you will, so it is not tampered or influenced by the Chinese government or all the New Age movement). When this happened, the same question came to me: did O´Sensei study Chinese internal martial arts while he was there? It seemed so obvious. But on the other hand, and as Pranin Sensei puts it, it was very improbable. Therefore I came to the following conclusion: O´Sensei was an observer of nature, and the Omoto religion as well, which is the same way that internal chinese martial arts developed. Taiji, Ba Gua and Xing Yi all predated Aikido, and were created by geniuses; but O´Sensei was also a genius and could have easily “figured” all this concepts by himself. The Chinese state that in the beginning there was the Wu Chi, which gave birth to the Ying and Yang, who then gave birth to Taiji (the Supreme Energy), who then gave birth to Ba Gua (the Eight Directions of the Universe: does anyone remember O´Sensei saying that we must move or cut in all eight directions? ), and who them gave birth to Xing Yi (the Five Elements that compounds this Universe). All this was then put into a physical form by these geniuses for better understanding, and maintaining good health and being able to defend in all aspects of life. These are all concepts that an enlightened soul as O´Sensei´s, and with his studies in Omoto and many other subjects, could have taken out from observing his surroundings too. I even dare to suggest, since I am not an expert, that all this concepts are exemplified and explained in the Kojiki and other old texts, which we know O´Sensei also studied. Therefore, I don´t think it must be a subject of too much discussion, since what truly matters is the essence of the knowledge itself, which at the end, is the same everywhere. Just look at the way the Sumers, the Greeks and many other ancient great cultures thought about the universe. Another example of this would be what I have found so far: Taiji and Aikido are physically and energetically the same in essence (of course, Aikido lacks some level of sophistication in its self defense techniques, most probably, in my opinion, due to the time they both have had for developing). They only differentiate in the final goal when defending against an opponent in a physical life or death situation: Taiji practitioner will kill the opponent as soon as he can (again, in an imminent life or death situation), while Aikidoka will do the utmost effort to spare the opponent´s life and harm. But the real reason they were developed was to provide the practitioner with tools to accomplish his or her mission in this life, and do it with good health and quality of life. I don’t think that I’ve actually seen many people support the direct contact with Chinese martial arts theory in the last few years Ellis wrote some good posts debunking Bruce Frantzis’ theory 10 years ago (http://www.e-budo.com/forum/archive/index.php/t-11036.html) on e-Budo. OTOH, that really ought to be separated from the investigations into the transmission of core principles of internal Chinese arts to Japan historically, and their appearance as part of the Japanese tradition, such as that made in Ellis Amdur’s “Hidden in Plain Sight”. Regardless of Bruce’s command of the historical facts, I think that his categorization of Ueshiba’s skills as the same as the Chinese skills he would later study is quite interesting. I think that the argument that Ellis and others are making is that these skills were already inherent in the arts that he learned from Sokaku Takeda – that those skills had passed from China to Japan at some time pre-dating both Takeda and Ueshiba. It’s an interesting idea, historically, but looked at in one way there are potentially startling implications regarding training methodology, if you go down that road. It’s a no brainer that you need a background in Chinese culture to understand much of Japan’s historical development in government, language and religion. Why would it be different in Budo? First independent thought. Aikido is nothing more, technically, than applied universal principles. Aikido or any other martial art doesn’t have propriety principles. You really don’t need a background in other culture to understand these universal principles. I believe ancient and specialized language that describes or explains these open principles complicates their understanding. Like the well-known push hands metaphor, “listening.”. You don’t need the understanding of the Chinese language to understand the principle being applied. What you need is intelligence and experience to understand the principle being applied. Here is the second. Learning Japanese or Chinese culture isn’t part and parcel to learning to defend yourself. Learning culture is what makes something an art. This too can be a point of confusion. Because when you add a new cultural influence into an established art, it changes the art. Of course there will be various conflicts and problems resulting from it. The operation is far from being transparent. It may be the very reason why some arts are so protective of their cultures. This could be one of the ways new arts are created. Transparent absorption of a part of one art, i.e. knowledge into another successfully is very rare, because it is very difficult. And finally, similarities between two arts in terms of knowledge often is a result of a shared third party source. Like that of the Dharma wheel which we see in both Aikido and Ba Gua. Both China and Japan had Buddhist influences on their cultures. It is logical and reasonable then to say the Dharma wheel found in both arts came from a third party and not a result of each other’s influence. Having a breadth of knowledge makes knowledge less malleable and ductile. There is no shaping of knowledge than to fit any particular need of an art or an individual. The essence of knowledge is more pure and less polluted. Pure knowledge is highly valued. The Dharma Wheel example is saying the directionals used by Osensei has a 100% likelihood coming from Kenjutsu and was communicated through the Dhama Wheel initially. As for Tai Chi and the other similar modern arts directionals have a 100% likelihood of being from an ancient Kung fu Shaolin system that too used the Dharma Wheel as a communication tool. Or it came straight from Bodhidharma. I agree, understanding the principles themselves are not culture dependent. However, understanding what Morihei Ueshiba said is extremely culture dependent. 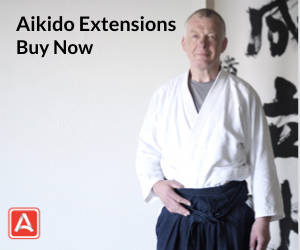 If you’re interested in what the Founder had to say about Aikido then….it’s a no brainer, for me. And it’s not a new cultural influence – Morihei Ueshiba and his students were immersed in that culture – check out (http://www.aikidosangenkai.org/blog/archive/2012-09-16/aikido-shihan-hiroshi-tada-the-budo-body-part-6) where Hiroshi Tada says that he was raised reciting the Confucian Classics. Morihei Ueshiba himself was educated in a Shingon temple (Shingon itself being an import from China), and the language colors and informs his writings. I think I remember reading in “Spirit of Aikido” by the founder’s son, or perhaps one of John Steven’s books on the founder’s history, that the founder read chinese classics. Anyone know if that’s like myth stuff or instructional type stuff? Also, Kisshomaru Ueshiba wrote that the founder’s brilliance lay in bringing out the best of both Kenjutsu and Jujutsu, and there is quite a lot of turning and multiple-attacker considerations in Kenjutsu. From a broad perspective…. all of the Asian martial-arts (not to mention calligraphy, formal dance, and many other things) that use the Yin-Yang symbol or idea (like In-Yo and A-Un, etc.) are talking about a type of body movement that was widespread and near-religious for many centuries. A number of Ueshiba’s comments are directly from the Chinese classics about the theories of martial-arts and body-mechanics. Did he get these studying Bagua in China? Highly doubtful. Do a lot of Aikido techniques resemble Bagua techniques? Sure, but Bagua techniques resemble the techniques of a number of arts in China. We’re probably not looking at anything mysterious here… the relationship between China and Japan has been around for many, many centuries and the idea that the two evolved separate martial-arts is silly, particularly given Ellis’ research showing the wide availability of Chinese martial texts some hundreds of years ago. I tend to agree with the general theory that Ueshiba got a good start on internal-strength matters from Takeda, but somewhere along the way he was taught the “relaxed” methods. Good chance that it was via someone in Omoto-kyo, but that’s really just speculation. I think your reply states things very well. The problem for me is that a number of advocates of the “Chinese theory” of aikido imply or state outright that Morihei secretly learned Chinese arts, that they were the source of his martial skills, and then concealed the fact. I have yet to see any proof for such a theory. Stan, I think one of the problems arises from the old Japanese government program of not allowing attribution to foreign sources for information. Hence, a lot of the western views of Japan are and were colored by the idea that Japanese things like martial-arts, Japanese swords, etc., were purely Japanese in origin. Plus, many westerners interested in things Japanese never got to view Chinese things (because their borders were closed so long). In a more normal century, more people would have seen Japanese, Chinese, Malay, Indonesian, Thai, Vietnamese, etc., things and realized that there was much dissemination of same/similar information all around that part of the Rim countries. Spot on Mike! Thank you. The comments here are all sound. There is no proof of O Sensei having a Chinese martial arts teacher and the ties are unlikely in O Sensei’s lifetime, but a. Human anatomy and methods to most effectively use it and manipulate/damage/destroy it have changed little since we lost opposable toes. Cultural contamination is obvious. Saying the Chinese and Japanese have nothing in common is like trying to insist Canadians and Americans have nothing in common. Korean arts like Hapkido claim Daito-Ryu influence. So why is the idea so compelling to some? I too studied Taiji along side my Aikido. I could train alone, and I didn’t have to sit in seiza or change clothes. I could work on relaxed movement without having to ignore or compete with the more belligerent Uke. In the end, I could read about Taiji and after 20 years I can still find huge amounts of history and research to go through. As a nurse, I have an opportunity to teach Taiji to cancer patients. Contrast that with my teacher, who was a direct student of the Founder but spoke poor English (and I spoke no Japanese) and when pressed said, “no one understood O Sensei.” We followed up with, “but now you are a Shihan, and you have come to understand, right?” “NO ONE understand O Sensei!” Truth is, I barely understood my teacher some times. Famous teachers spent less time directly under O Sensei than some of us have spent with his students. We’re worried about losing O Sensei’s art? His own students can admit they never understood the source, and now generations later we are the blind leading the blind. The Chinese arts with their many forms and myriad training methods and extensive mythology/history can create the illusion of a clear transmission of knowledge. Our students want to understand, and they wish we could give them a level of understanding that other arts will claim to be able to deliver. But, they love our art. They would rather mix Shinto and Daoism than chose to simply study somewhere else to get what they feel they are missing in our explanations. This debate will not die until our students believe we are representation enough of O Sensei. As long as we claim (and prove) confusion where others claim clarity, our students will continue to seek knowledge in other Arts. I would have said something similar about the human body. I think we Americans have a bit of a problem being such a new nation. Even in Europe what we count as history is almost current events. Martial arts have been invented, preserved, deteriorated and reinvented in all cultures where there was sufficient threat to be a motivator and sufficient stability to allow the development and preservation of martial traditions (ever since we had opposable toes!). Thanks Stan Sensei for bringing “The Demon’s Sermon on Martial Arts” to my attention. It’s another 17th century Japanese classic which clearly demonstrates the cross-pollination of martial arts and philosophy in the Chinese-Japanese-Ryukyu-Korean region. One interesting fact which provides some dots but does not connect them, is a photo on Christopher Li’s WEB site in an interview with Okumura Sensei. It shows a Japanese military police manual on self-defense with some drawings that look like someone walking the circle, a primary Ba Gua practice form. Another dot yet to be connected is O Sensei taught at the Military Police School. Given what he drew from Kashima Ryu teachers who came to the dojo, he certainly was capable of learning and adapting from just watching without in-depth study. None of this proof but it is more data than I have seen in the past. I would tend to agree. If we could just get our hands on some hard evidence. That’s what I’m waiting for. There is no proof likely forthcoming. As some of Sensei Pranin’s excellent research has shown, we are vague on O Sensei’s military record and much of his Doka is the result of someone else’s work. His lectures weren’t much understood by the people closest to him. We don’t understand O Sensei well, and this has been as much due to him, as to his followers. Frustrating and sad. I am grateful for the work on this site. Baguazhang does have some ideas in common – at least, what I have learned from Shifu John Painter. There are major differences in ethics and training methods. To call Baguazhang one art is as inaccurate as it is to call Aikikai a singular art. I don’t know if Aiki Expo ever had any Baguazhang teachers present. I would recommend it. There is a potential for a future discourse that does not have to be based on unsubstantiated “history.” As Nev said, who cares about what went before, the value of any art is in training and learning. Sometimes that means sharing. Stan’s work as a historian of Aikido should be highly appreciated. Objectively speaking, however, it’s a general rule that demonstrating that something is not existing is more difficult, often practically impossible, than claiming that something is existing. In the case of Aikido, one of the two capital influences is (according to your study, Stan) that of Daito-ryu jujutsu, transmitted by Sôkaku TAKEDA to Morihei UESHIBA, the other being the contribution of Ohmoto religion. The former has a very long history which can be traced back, at least, to MINAMOTO family (Yoshimitsu, 1045 – 1127). But the upstream source is not clear and might have been brought from China to Japan in the 9th century along with “Zen”, which had been introduced into China from ancient India by Indian monk Bodhidharma in 520. On this assumption, the aikido born in Japan and some old martial arts surviving on the old continent may well possess a same old ancestor. Then, in some sense, the situation may be similar to that of the Origin of human species. I mean the relation between Homosapiens and Neandertal. By the way, do you know the striking similarity that the tale of Izanagi and Izanami described in Kojiki (712) bears to the story of Orpheus and Eurydice in the Greek myth ? I don’t know why. So, “any elusive influence is or is not ?” does not matter at all with Aikido. Rather, would I wonder if the originality of Aikido resides in the application of Kotodama theory, on which Morihei UESHIBA constructed his art from materials in his experience of Daito-ryu jujutsu, amongst others. After all, isn’t it, the essential in Aikido is its invisible part (and not the apparent physical movement), and the invisible is the ki-state got through Kotodama practice as far as Morihei is concerned (otherwise, through some particular mental concentration methods in the case of Koichi TOHEI, or Gôzô SHIODA, or through “Soto-Zen” practice for Katsuyuki SHIMAMOTO Shihan, for example) ? I very much enjoyed reading your thoughts, Minoru. Thank you! A little bit late, but of course, Kotodama theory is important. And if you actually get into a study of Kotodama you will immediately see the direct Chinese influences – look into Shido Yamaguchi for some very clear information on this matter. Further, Soto-zen, and all Buddhism, of course, came directly to Japan from…China. Tohei was influenced by Tempu Nakamura’s Yogic influence, for more information why this is important I suggest that you look into the links between Morihei Ueshiba, Sokaku Takeda (and the Japanese warrior class in general) and esoteric Buddhism, and the links between esoteric Buddhism and Indian Yogic practices. Why is it important? Well, it’s clear that very few people understood what Morihei Ueshiba said, and that very few these days even examine it in any deeper manner. I think that if you look back at those sources you will find that they have an illuminating effect on Ueshiba, and will show the common underlying methodology to which he referred. I am in envy of your knowledge of Asian Martial Arts and of your reading a lot of literature about that subject. I was born Vietnamese with Chinese parents, living more than 30 years in the West, perhaps I have a different perspective / mindset concern this subject. If someone said that the societies and cultures of Japan, Korea and Vietnam have Chinese influence, I would say, definitely YES! If you were an educated person, you were supposed to do it in Chinese and Chinese Literatures, Chinese thinking and Chinese Philosophy. But you are still Japanese, Korean and Vietnamese. Chinese Literature, Chinese Philosophy means, inclusive Martial Art and The Art of War of Sun Tzu. The influence is great when you were born and grew up in such an environment. I think the credit is to O sensei, Aikido Founder Morihei Ueshiba, is that he picked out the essential part of the Baguazhang or other Martial Art to make it into Aikido and last but not least to past it on to our generation, inclusive westerners, this is a big achievement of Aikido Founder Morihei Ueshiba. Without westerners we will keep it in secret forever and forever! What do you think, if I say that in our modern western countries have a lot of Chinese Influences? What about Paper, Weapons, Compass, Printing technique, Paper money and a lot of things. Some of these things already existed more than 2000 years in China! Impressive, right? “The civil service idea did not originate in our country, however, nor in Europe, though it is true that in passing this legislation, Congress followed the immediate lead of Great Britain and France, both of which had taken similar action a few decades earlier. The first county to install the merit system was China. In the year 165 B.C., China inaugurated what later became a widespread system of competitive government examinations. As part of my M.A. in Classics and English (20 years ago), I decided to study Greek martial arts (esp. Pancration) as communicated through ancient sources (texts, pottery paintings, and statues). Especially the archaeological material was interesting, and after having delved through pretty much everything available from antiquity, I had to conclude that I could write a full textbook on Judo and a partial one on Aikido – illustrated exclusively with material that is app. 2,000 years old! This, of course, led me to speculate on possible explanations for this. But though it was theoretically possible that Judo was actually invented by the Greek, who then brought it all the way to India (after Alexander the Great’s vast expansion of the sphere of Greek cultural influence), whence Bodhidharma brought it to China etc. etc., I had to abide by Occam’s Razor and arrive at a similar conclusion to the one explained by Mr. Holland: That the human body has two arms, two legs, one head, and a reasonably constant center of gravity. This being the case, there are only so many ways to fight another humanoid, to move your body, to remain calm under duress etc. This being the case, and the history of martial arts having its origin quite probably around the Dawn of Man (give or take a day or two), the most probable explanation seems to be that each civilization seems to (re)invent the outer as well as the inner manifestations of humanoid combat. There is one aspect of Aikido history that I do find troubling. We were from Daito-Ryu and others, but separated. The extensive forms and techniques in Daito Ryu, the codification and much of the teachings get excised. Tomiki Sensei’s kata and forms get cut off of Aikido mainstream because of a philosophy regarding training methods. Other Judo and Aikido students leave, and their combined systems are excised from the body of what is Aikido. Koichi Tohei leaves after teaching for years and developing solo practice forms and teaching methods. One of his students develops baton use for law enforcement, and remains obscure while Aikido people leave to study Arnis. The Saito family was apparently asked to stop giving out Aikijo and Aikiken certificates if they wanted to stay under the Aikikai umbrella. Other teachers also had weapons systems that were also not made canon. There are pictures or text in Budo where O Sensei is working with handguns, rifle and bayonet, spears, fans and none of these became Aikido weaponry. The second Doshu describes Tanto work as having three situations – Nage using a knife, Nage defending against a knife, and Nage and Uke both armed with knives. There are many newer non-lethal weapons developed which should be compatible with our philosophy and techniques. If someone wants to study meditation in depth, they go outside of Aikido. If someone is injured, Tai Chi and Yoga are recommended for health and the health benefits of those arts are studied in medical journals. For all the importance of religion in the founder’s life, we are not a religion. Perhaps we should be happy that there are limits to what we will say O Sensei did – one pic on this site shows a Yogaish stretch, and we don’t try to come up with stories of O Sensei’s travels in India. Individual teachers do add to their knowledge of stretching and healthful practice, but our art as a whole does not. The development of Aikido as an art under the Aikikai appears to be subtractive. Since the Founder himself, who has fully been allowed to contribute to our knowledge without political fallout? 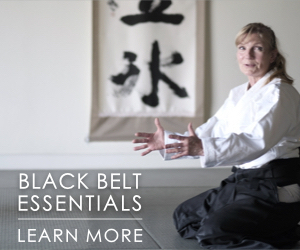 Who has added to the technical and philosophical knowledge of Aikido? This is common in other arts. Instead, ideas and people are marginalized and discarded. And, this article and its responses do go and show how we respond as an art to a potential new source of information and ideas. Judo has added new techniques after Kano’s death, and karate forms have been modified after Funakoshi’s death. MMA and BJJ have no problem adopting ideas from Judo and wrestling. Sugawara Sensei was my teacher when I practiced in Japan. Aikido has nothing like circle walking, which is a central practice of Baguazhang; or the single palm change, another signature movement which is at the core of baguazhang. I thought of this picture when I read this article again. I couldn’t seem to attach the picture directly. That’s really an interesting comparison. Some years ago I spend my vacation in a beautiful rural region in Tuscany. Sitting outside the cottage, enjoying the sunset and a fantastic red wine, a woman passed by with a Tai-Chi sword in her hand… after a short chat, she invited me to train with the local Tai-Chi group. So I met her teacher, a elderly Australian woman, living in the region for some decades. However, after my first Tai-Chi lesson she asked me to show her some Aikido. She never saw Aikido before, so I demonstrated some basic techniques (Shiho-nage and Ikkajo) with a student of her. After my short demonstration she was surprised and told me: this is like Baguazhang! Intresting, isn’t it…? I think that Ueshiba O-Sensei was a very creative person and integrated different teachings in his art to find his personal expression and fulfil his ideas wich lead to become Aikido. So it really doesn’t matter if he observed some Chinese masters or perhaps took some lessons from them. Aikido is his personal and genuine art and generous as he was, he presented his insight’s to all of us. Aikido as an art is complete. There is nothing to add or to omit. So, just train persistently and don’t let your mind be caught by things that really doesn’t matter. Huge fan of your work. Was recently introduced to your videos by a friend. This is an interesting piece . Being a student of history and a poor student of Aikido I am fascinated on the influences that spur individuals to share great vision. In reference to this part of your piece. Would it possible to know the source or where one could find more information on O Sensei’s visits to China to Shinkyo? 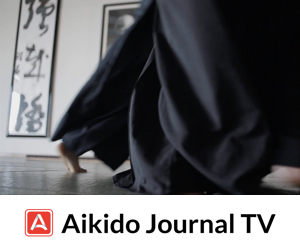 I believe you will find the most detailed information on this subject here on Aikido Journal. There is very little in Japanese on this subject either. Spiral body. Solo excercises. Compare what systems have what and how long they’ve had them. Have fun. Find a teacher who understands the body in terms of yin yang seperation/harmonization and has a clear training method for gaining the skill. Look at their students and see how many who get it. Look for true Peng, Lu, Ji, An.